Our Verdict: In so far as e-cigs are concerned, Vivid Smoke has got a long way to go in delivering top-performing kits for beginners and advanced vapers. The features of their starter kits do not resemble those of mods and superior units. Then again, their selection is extensive, and they offer a great assortment of accessories that any dedicated vaper would recognize and admire. Starting off with their most affordable starter kit, we have seen a practical piece of a vaporizer on the Ego-V. It is an entry level kit for beginners who want to vape and vape—nothing more and nothing less. The build on this reasonably priced device is compact and reliable, with a black body accented by metallic bands and a glass vape tank. Unlike other same-priced cig-a-like units that look frail and breakable, the Ego-V has a design that equates more advanced and costly vape pens. 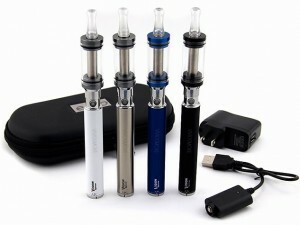 It comes with a CE4 clearomizer with a glass tank that shows how much remains of your e-liquid. In cases when the wick gets overused, or any part becomes non-functional, all you need to do is purchase a new CE4 clearomizer as a replacement. 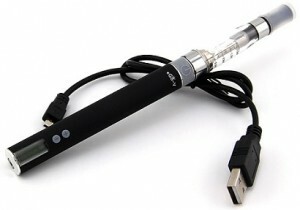 The Ego-V has a black 650 mah battery that gives you around 6 hours of light to moderate vaping. 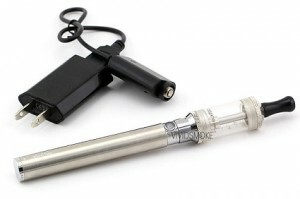 Since it is a pass-through battery, users are allowed to vape while charging the device through the included USB charger. The quality of the vapor is above average for any beginner who needs just the right amount of flavor and throat hit. Another Vivid Smoke starter kit for beginners, the Ego-C Twist + Aspire Vivi Nova Kit allows its users to take control of the vapor quality. The exterior build of this kit is a combination of stainless steel and aluminum, with a choice to select between different colors of tanks. For its price, it is a compact unit that is convenient and safe to carry around in your pocket. The Ego-C Twist is a variable voltage kit that enables you to set the battery between 3.2v to 4.8v by simply twisting the cap at the bottom. If you need stronger and warmer vape, you can choose the higher voltage at 4.8v. If you are up for cooler vape in larger amounts, then set the voltage to 3.2. The 900mAh of power is good enough to last hours of continuous vaping. 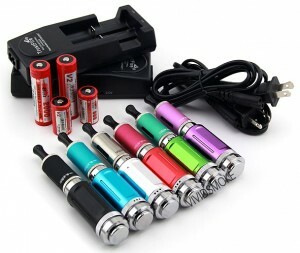 Vivid Smoke allows customers to upgrade to an 1100mAh battery for only $3 on top of the kit’s price. 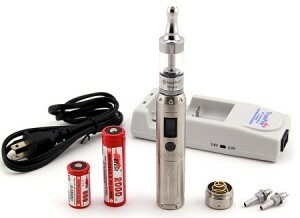 This kit is likewise great for advanced vapers who want cool and flavorful vapor from a portable and inexpensive kit. Plus, it can be used with any other Ego or 510 threading tanks. So if you have one of these in stock, then you can try which one works best for your taste. Here is an example of Vivid Smoke’s popular personalized product: the Custom Ego Twist Bling Cheetah Edition. This kit is for the fashionable vaper who adores colors and some bling. The battery comes with black and blue crystals that display craftsmanship. It has a clear pyrex glass tank and a black-aqua blue dual anodized drip tip that is easy to refill with your chosen e-liquid. For the discreet vaper, the design may be a little too loud to handle. But for those who want their vaping gear to look special and unique, this kit is, without a doubt, a fantastic choice. Not only stylish, but the Custom Ego Twist Bling is also a combination of highly reliable and durable parts such as an Ego 1100mAh battery, 510D Boge Cartomizers, and a 3.5ml Affinity pyrex glass teal tank. Vivid Smoke also has couples packages with fancy designs, such as the K100/K-101 Aspire Nova-S Couples Package #1. If you are a couple with fondness towards animation and endearing characters, then this kit is for you and your partner. The colored stainless steel and animated drip tips are not only cute and adorable but are also engineered to last for long term use. The K100/K-101 Aspire Nova-S Couples package has two complete sets of mechanical mod units with a standard voltage setting of 3.7V. It includes a blue robot drip tip (for men) or a purple bunny drip tip (for women), and 1 Boge low-resistance or standard resistance XL cartomizer, 1 charger, 1 18650 battery, 1 18350 battery, 1 6ml anodized DCT, 1 telescopic mod, and 1 safety fuse chip for each set. A powerful kit that creates top-notch vape, the K100/K-101 Aspire Nova-S is meant to satisfy both beginners and advanced vapers. It’s an overwhelmingly inclusive kit for beginners and an equally rewarding package for advanced vapers. The ZMax V3 Glassomizer BCC Package includes one 18350 Effest IMR battery, one 18650 Efest IMR battery, and a choice between a Kanger Pro tank 2, Kanger Pro tank 3, or an Anyvape Davide. With such renowned brands put together in one kit, the Zmax V3 makes a resilient package that is powerful and efficient in producing quality vapor. Each kit also comes with a Sigelei ZMax battery cap and body, a Trust fire TR001 charger, two atomizer coil heads, and an excellent aluminum drip tip. All in all, Vivid Smoke is a brand for beginners and advanced vapers, with starter kits that can be upgraded with a sundry of accessories. Their collection does not include mod kits, but they do sell separate mods that you can use with some of their tanks. It appears that to compete with plenty of other brands in the market, Vivid Smoke starts from the most basic and inexpensive starter kits that make vaping easy for any newbie. These entry-level kits include everything that you need to start vaping, without any complex functionality. Once they convince you to purchase their basic kits, they then introduce more expensive kits with added features and accessories. These are their Silver Kits that are meant for upgrading from basic to intermediate. The Gold category is for any advanced vaper who takes pleasure from customizing and enhancing parts or features of their vapes. Vivid Smoke gives out a free tank band for purchases that cost $30 or more. They also have a referral and affiliates program to reward their loyal customers. Their shipping is notably quick, with a 24-hour turnaround time for orders placed on Mondays through Saturdays. Priority Shipping is given to purchases that amount to at least $75. A small shortcoming on the brand’s side: while focusing on the variation of their products, Vivid Smoke seems to have overlooked the quality of their website. On the surface, it looks organized and much similar to other brands’ websites. But as you navigate through the pages, you will notice that it is a bit difficult to find a particular product based on their categories. Apparently, their products also lack reviews on their site. Nevertheless, one who is looking for different vaping needs will most certainly find them on Vivid Smoke’s website since they also resell e-liquids and vaporizer parts from larger companies. Thus, even with some weaknesses, Vivid Smoke can be a dedicated vaper’s one-stop shop. Eco-Cigs Review – Eco-Friendly Vaping? With just two products to offer, Eco-Cigs would need to have quality products that are worth choosing over the competition. Do they? Pure Smoke E-Cigs Review – Smoke Or Vapor? Pure Smoke is a company that specializes in cig-a-likes. Do their products have what it takes to compete with other brands?